RPG Games 4 Free is a great site to get all the role-playing games you could ever want. These games are full color, and some have sound effects, all are free to download with no hidden costs. The biggest draw for the RPG is you choose a character and control what that character does within the game. You can be a wizard, a hero, ogre or villain and you are limited by whichever free RPG game you play. In these titles, you become the one who either saves the day or annihilates the country by your actions. 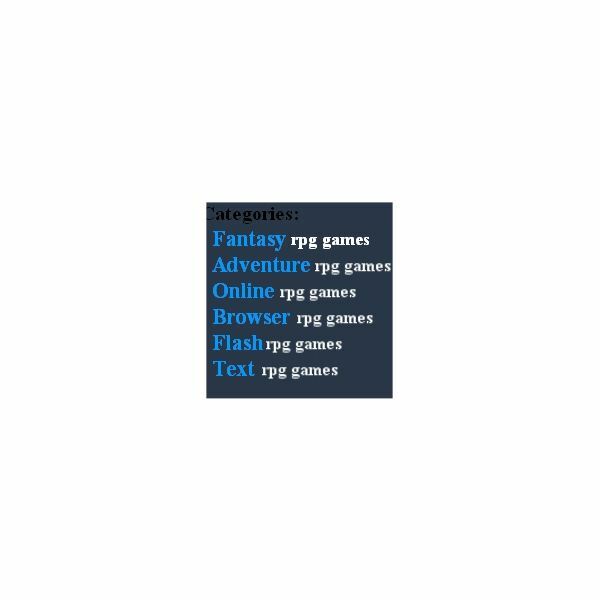 There is plenty of fantasy, adventure, online, flash, and even text titles, to choose from. 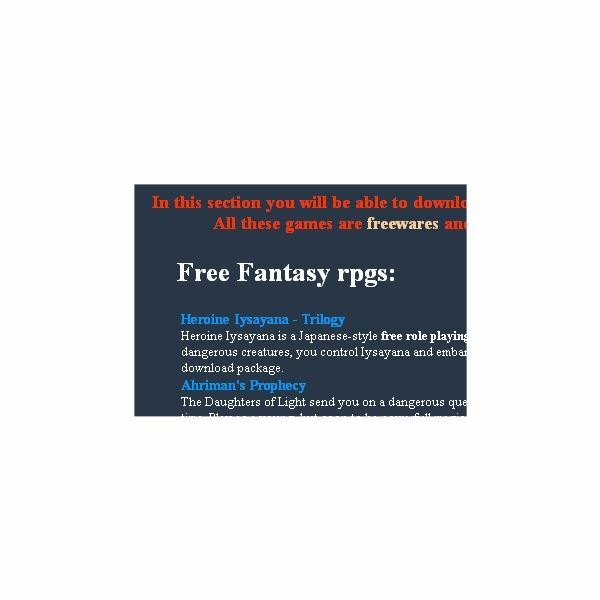 All of the titles on this site are freeware titles that are legal as a free download to add to your hard drive so you can play anytime you wish. If you enjoy fantasy, be sure to check out Heroine Iysayana, which is a trilogy with all parts on the site. You will become the hero and travel through full color graphics in a world of normal humans and evil creatures. Will you be able to save the day, or need to surrender to the folly of the evil creatures? In Light Slayer, you are a apprentice and one day your master disappears, so you set out on a quest for find the master. What will you take other then a sword? The forest is full of creatures that are hungry, and other perils lay hidden within the caves. Have no worries it is just a RPG game, but you will become addicted to it quickly. With plenty of titles within this site, you are sure to find many new favorite RPG games to enjoy. The site is heavy on the advertising but that is what helps keep the best RPG games free. It is mostly text so it does load quickly and it is easy to search among the games. On the individual RPG game title pages there are screenshots, along descriptions of each title, which makes it easier to find a title, which you will enjoy. The PC games here play on the various types of operating systems such as Windows 98, XP, 2000 and Vista. All of these games have bright graphics and sound effects because they are the whole versions of the RPG games. 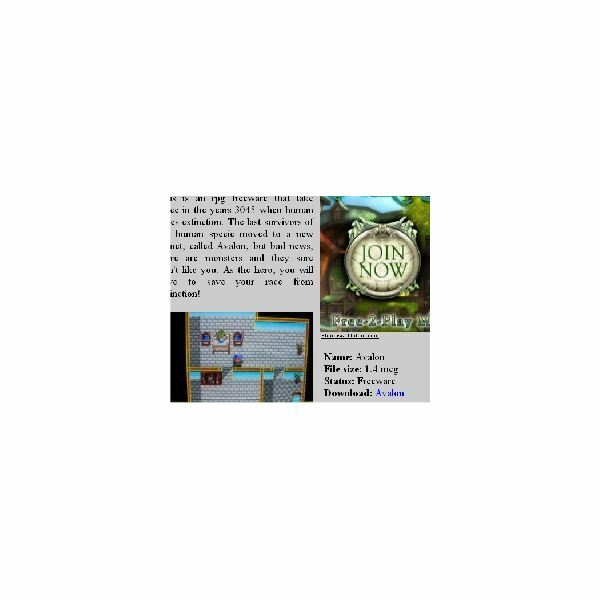 This web site has all the best RPG games you could ever want; it is easy to move around the site. There is plenty of screenshots, of games for you to enjoy. These are free downloads, so save your money for a bigger hard drive and download more free RPG games. Try it out, I hope you will enjoy the games, as I do.